I usually manage to quit eating so much chocolate after Christmas, but as a general rule I’ve never had any serious success at a real diet overhaul as a New Year’s Resolution. I quit making those resolutions years ago. But for some reason, hearing Amy and Holly write about doing Whole 30 in January really put a bug in my brain this year and I decided to do a month of clean eating in January. All grains including oats, rice, wheat, barley, millet, buckwheat, and corn. I find this overly restrictive and unhealthy. All legumes including beans, chickpeas, peas, lentils, and peanuts. I also find this overly restrictive and unhealthy. All forms of sugar and sweeteners including honey, maple syrup and agave. Carrageenan, MSG, or any sulfites. No white sugar or artificial sweeteners (i.e. Stevia, aspartame, Sweet ‘N Low). Natural sweeteners such as honey & agave are okay in small quantities for tea and salad dressings. No dairy, with the exception of goat cheese, low fat milk, and small amounts of butter. No coffee. One caffeinated tea on work mornings is ok. 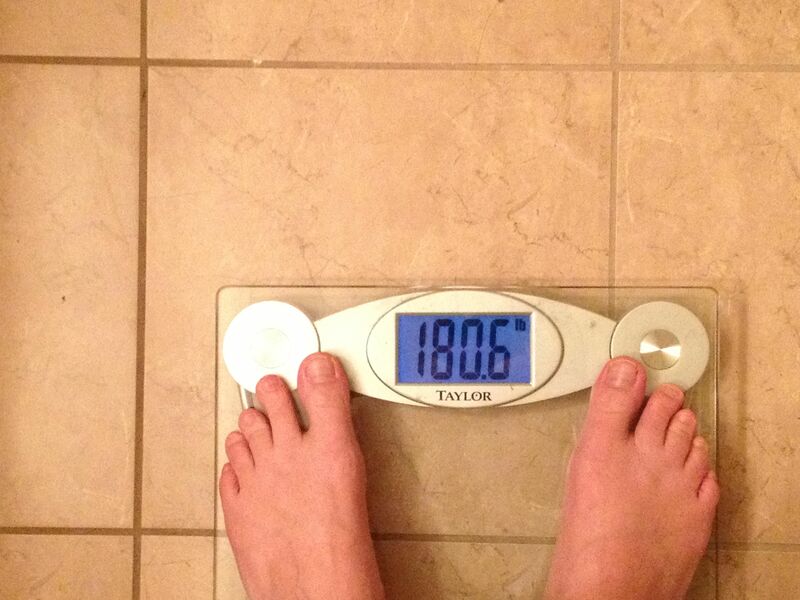 Starting weight. Image source: my own! I’ve been struggling in a major way with my weight for the last two years. A lot of it is related to physical limitations with exercise due to my herniated disc, but a lot of it is also related to my diet. I’ve been hovering between 180-185 lbs for the last two years and have had very real trouble getting and staying under 180 lbs. I am determined to do it this month and never see that number again on the scale. The biggest food items I struggle to eliminate usually are sweet baked goods, sugar in just about any form, cream in my coffee (heck I even named my blog after this one! ), and cheese. Though I do love them, I don’t consume enough healthy complex grains and vegetables. So my personal 30 day clean eating plan directly addresses these specific food issues and will hopefully create some much healthier habits for me. I’ve stuck to this regime with only 1 real slip-up this week: I made quickie butternut squash pasta the night I’d been planning to make chili, because my roommate had a date over and was watching a movie with him. My clattering of pots & pans while cooking up a storm would have been loud and distracting, and I would have felt like a jerk! So far I am down almost 2 full pounds in only 6 days. I’ve been more conscious of what I put into my body, more connected to my food, and more motivated to move my body. And the weirdest experience: I have had absolutely no trouble eliminating sugar, but I have had a recurring craving for wine, of all things! What the heck?! This is unprecedented! Watch Clean January transform me from having a wicked sweet tooth into a wino instead. This entry was posted in Health, Wellness and tagged clean january, diet, food, healthy eating on January 7, 2013 by A Little Coffee.